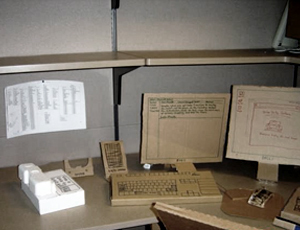 W-ORD › A Contemporary blog of Rhetoric, Words and Culture. Words and Culture. The languages in focus are primarily (but not exclusively) Swedish and Am. English. OROSMOLN (Swe) = “worry-cloud/s”. Perhaps the closest translation would be “storm cloud”, although in the case of the worry-cloud, its use is only in the figurative sense (never to describe a weather situation). a heavy, dark rain cloud. the beginning of the decade saw storm clouds gathering over Europe. Referring to a specific grandparent, it quickly becomes confusing (in English). There is simply no way of knowing which grandparent you mean if you say for example “my grandmother”, i.e. which of your parents’ mother? This is similar to Norwegian, where the word “bestefar” and “bestemor” are used for both sets of grandparents. “Beste”, is equivalentish to “grand”, meaning “best”. A grand piano, a splendid pear*. Sounds very nice but very nebulous. The Swedish word for grandparents is “mother-and-father-parents”. So far not so elegant. But. Here is the practical part: Your mother’s parents are mormor and morfar (“mothermother” and “motherfather”), and your father’s parents are farmor and farfar (“fathermother” and “fatherfather”). More specific, more practical- the term tells you exactly who you mean. 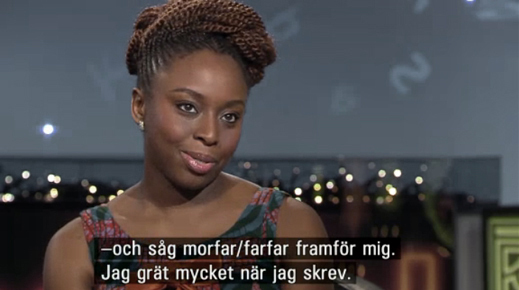 A specificity that is hard to negotiate, as exemplified by the Swedish subtitles of an interview with author Chimamanda Ngozi Adichie recently on Swedish television. Adichie is describing the reasons for writing about the Nigerian-Biafran war, and she mentions her family; the fact that her grandfather was in the war. The conscientious translator cannot know for sure which of her grandfathers Adichie is talking about, hence the solution to use the slash. Either/or. Morfar/farfar. If we would agree that it is a lot more practical to say “morfar” than to say “my grandfather on my mother’s side” (following the question: “which grandfather”? ), we still can’t really escape the slashes. Obviously, when two women or two men have a child and eventually a grandchild, then there could be various potentially confusing combinations of duplicate (or even quadruple) “mormor”, “farmor”, “morfar” and “farfar”. Suddenly that specificity (if it’s only applicable to heterosexual nuclear family structures) loses its shine. Perhaps the more vague and general prefix “grand-” is preferable after all; at least equally confusing for all grandchildren (barnbarn, “childchild”). * päron (Swe) = “pear”, slang for “parent”. • to ensure you get some sun action on your vacation by getting a ticket to a warmer/sunnier destination (such as Greece, Crete, Turkey or Mallorca) rather than hoping for (unreliable) sun in Sweden during the weeks you have off work in the summer. The travel agencies notice that during a particularly cold spring like this one, many people decide to sun-secure/solsäkra their vacations as early as in April. is a slightly older, but related word. This term cannot be used when talking about vacation time within the borders of Sweden (no matter how sunny it is during that particular time). A “sun vacation” always implies a vacation that is set abroad. Soil is earth is dirt is what we are. Even though we came from stars. Ignoring death, but being reminded of it constantly. Smoke screens made of practicalities and politics can be useful. To those of us who know we are toast. The only thing that sounds plausible. Fragile and perishable. Afraid [of the inevitable] is not a strong enough word, to be afraid of nothing is an oxymoron. The unconscious has no duration, yet it is forever. Fear of the finality. Incomprehensible, sickening, appalling. Susan [Sontag] was not interested in quality of life, just life. No matter how painful the cancer treatment. Death is so absurd that Mario [Super] had to be born with 3 as a minimum, and more to be earned with a little resilience. (Tamagotchi could be resurrected, naturally). 3 consecutive life sentences + 30 years; a US prison sentence. If the prisoner resurrects, he will spend his entire second life in jail too, as well as the potential 3rd. Would he pull off the stunt once more, he will be released after 30 years. “How to be chic, fabulous and live forever” is a book about physical immortality. Its title: catchy (on purpose according to the author), its content: dead serious. “Sweat out your unconscious death urge in a sweat lodge with help of a Medicine man/woman”. “Get re-birthed, to relieve you from your birth trauma”. “After a 15 year period of adapting your system to an all fruit diet, comes Breatharianism”. Hira Ratan Manek has not eaten for 7 years, he gets all his energy from looking straight into the sun. (NASA is supposedly investigating him). Aging is just accumulation of cellular waste. Longevity genes are activated by starvation. The cervical cancer cells of Henrietta Lacks, who died in 1951, are immortal and still multiplying. Heads are deep frozen in Arizona. Mind uploading will happen. Right after our time. (So close but no cigar). Words can sugarcoat the crudeness of reality (I don’t eat sugar). Words of death, slathered with poetic or comical flavors to conceal its obscenity, its dirtiness. Pass on, pass away, slip away, cross the great divide, bite the big one, kick the bucket. Omkomma, avlida, gå hädan, gå bort, trilla av pinn, kola vippen, gå ur tiden [exit time].